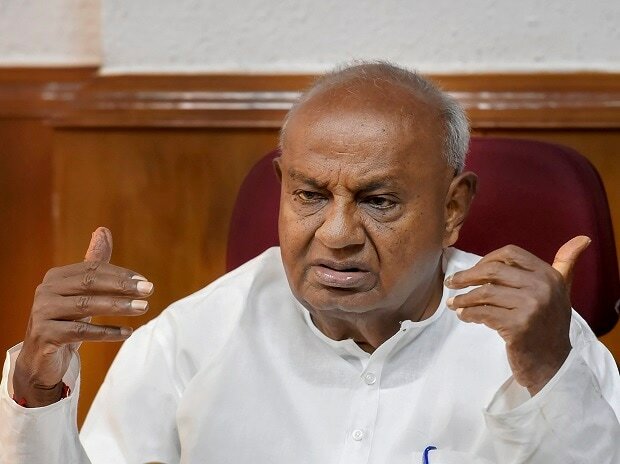 JD(S) patriarch and former Prime Minister H D Deve Gowda Monday filed his nomination from Tumkur as the ruling alliance candidate, but will have to face a rebel candidate from alliance partner Congress. Defying the electoral arrangement between the coalition partners under which Tumkur was allotted to JDS, sitting Congress MP S P Muddahanumegowda filed his papers. 85 year-old Gowda submitted his papers at the Deputy Commissioner's office in Tumkur in the presence of Deputy Chief Minister G Parameshwara of Congress and other leaders. "I'm filing my nomination as the Congress candidate... I'm not filing the nomination for fun, I'm a Member of Parliament fromTumkur and I'm contesting" he told reporters ahead of filing his nomination. I'm not a big leader to contest from anywhere...what should I do going to Bangalore North?" "Tomorrow is the last date for filing nomination, I still have faith...anything may happen any time in politics.There is time till 3 PM tomorrow,I will wait," he said to a query about his move in case the Congress does not give him a ticket. However, Parameshwara had later said they were okayif Deve Gowda himself contests from Tumkur. hard bargaining with the Congress as the party did notconcede Mysore, another seat it had demanded, due tostrong resentment from CLP leader Siddaramaiah, as it is his home turf. Mysore and Tumkur both come under old Mysuru region,where the Vokkaliga community, seen as a strong vote bank of the JD(S), is dominant.